Bespoke Guttering offers a wide variety of guttering throughout London in a variety of colours and styles, including cast, extruded, and pressed aluminium as well as seamless roll formed gutters. We also offer UPVC products, such as guttering, soffits, fascias, cladding, and barge boards. We have an array of options to choose from and are confident we can find the perfect gutters for any property. That’s why we’re the UK’s number one supplier and installer of seamless aluminium gutters in Surrey. We have done work for a variety of clients, everything from newly constructed private homes to existing small businesses operating from a building with more traditional architecture. Our clientele has included architects, property developers, local authorities, and architects. We truly have something that will suit everyone’s needs and would be happy to help you find the perfect guttering solution for your home or business. You can view more of our portfolio here. Our installation team is completely mobile and can supply, fit, and repair any kind of rainwater gutter. Aluminum gutter systems can be fabricated in lengths of up to 30 meters. This means there are no seams or joint, which means no leaking and less mess. We can connect your new gutters to your existing down pipes or install new ones. Our seamless aluminium metal gutters come in a variety of colours, are powder coated and scratch resistant. They won’t need repainting and surface cleaning is easy. We service the Surrey area, providing excellent top-level repair and replacement. Take a look at a recent downpipe installation in Cobham. 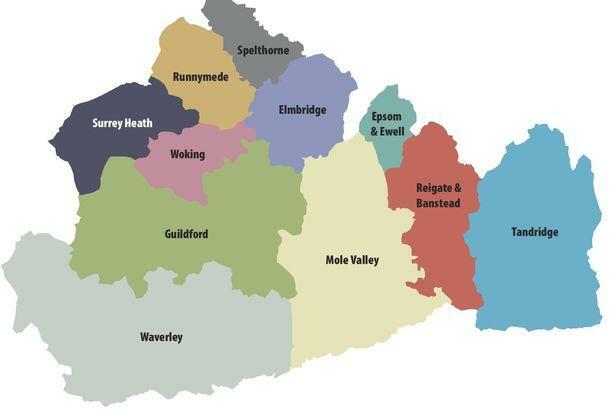 We also cover all eleven districts in Surrey, so whether you reside in Elmbridge, or Runnymede, we can take care of your needs. When you’ve invested in living in a nice area such as this, you want to be sure that your home stays in top notch condition. We produce less waste because we do all of the fabrication work on site, which means less waste. We make our gutters out of the highest grade eco-friendliest recycled aluminium available. As a company, we are committed to using sustainable products. We’re confident that the products we provide are the best on the market and a good investment this is why we offer a 30 year workmanship guarantee. In everything we do, we maintain the highest levels of quality control and safety standards. This type of guttering has quickly become the new industry standard and being used up and down the country. But don’t just take our word for it. If you want to find out what our customers are saying, check out our reviews. Our customer service has a 100% approval rating as well as an abundance of positive reviews and testimonials. We consistently get repeat customers and referrals. Our clients not only come back, but they also recommend us to their family and friends. We feel we offer outstanding service and installation as well as a quality product. Our customers agree. We aim to give our customers a superior level of service and product to match. We give personalized attention during the whole process and approach it with a professional attitude and a wealth of professional expertise. We’ve been replacing, repairing, and installing gutters throughout Surrey for over 15 years. If you’re looking for UPVC, aluminium, or seamless guttering, we have something for all styles and budgets. We are available for jobs in Guildford, Woking, Esher, Epsom, Kingston, Virginia Water, Cobham, Weybridge, and Elmbridge. Call today for a free, no obligation consultation.